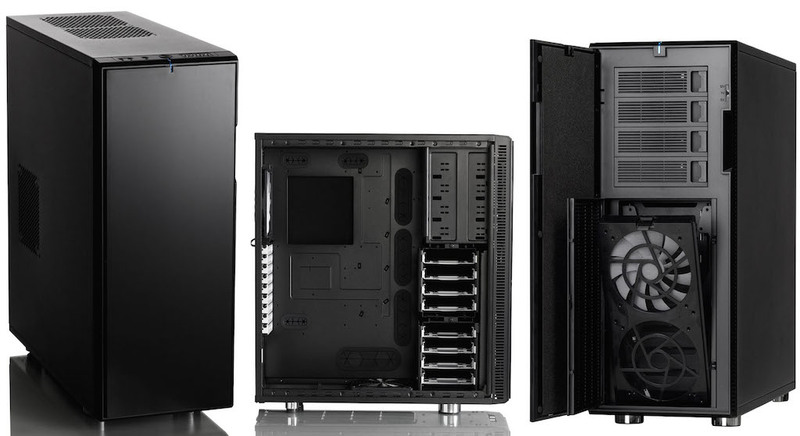 The Z97X-UD5H uses Intel’s latest 9 Series chipset which to this date is not being used in any Apple computer. There’s a good chance Apple will use this chipset in the next iMac refresh in Q3/Q4 ’14. Even though the chipset is not officially supported in OS X, it runs just fine, even without a custom DSDT/SSDT! I decided not to use the internal CPU graphics and opted for a NVIDIA GTX 760 based graphics card instead. With a few kexts from the Multibeast package I was able to use one of the two onboard NICs and the onboard Realtek 1150 audio controller. However, since I didn’t want to use any modified kernel extensions I bought an USB audio adapter and a PCI-e Ethernet card which both are supported natively in OS X Mavericks and Yosemite. Wake/sleep/shutdown works flawlessly. Speedstepping works as well although I’m only seeing P-states 8 and 40-44. I tried different SMBios-settings and using a SSDT in Clover generated with ssdtPRGen.sh all to no avail, it did not make any difference to the P-state spread. All USB 2.0 and 3.0 ports work out of the box. Just wondering if you’ve upgraded to Sierra yet. I did and everything seem to be working but one, shutdown/reboot. Just hangs. I have the same config as you but no external video card. David, works fine here. No problems with reboot/restarting this board in macOS Sierra. I have almost the exact same system (except skylake) and I wanted to just clarify whether you use the Intel CT Desktop kext injection, in addition to FakeSMC. The reason I ask is that you state that FakeSMC in the only kext you have to inject. I just want to make sure I’m not missing anything. Yes, it’s the only kext. The other one is a kext injector, it doesn’t contain any code. The latter could also be injected via Clover. Sorry, please delete earlier comment. I mean to ask whether I place the ionetworkingfamilyinjector kext in the clover EFI kext folder? I’m currently thinking about getting the Z97X-UD5H for a hackintosh and I would like to ask you a question. Now after about 10 months, does everything still work fine? Especially with Yosemite. David, everything still works fine. I’m still using a discrete GPU though, not Intel HD. And I switched the config.plist model from a Mac Pro to an 27″ iMac 2013. You said not wanting to use any modified kernel extensions. Why is that ? Does-it means your hack is more steady in any way ? Does-it mean it updates more easily ? Yes, easier updates and it’s a security risk. Almost same setup and I have it 99% working. The last bit that is frustrating is the networking. I used the same Intel kext you did into the clover 10.10 eufi folder. Network does find other computer over gigabit cat5e direct connect without router. I can browse folders. I start a massive file transfer and it gets a few gb in then the speed plummets and Finder beach balls. The overall os becomes unstable and I have to restart computer. I can’t figure out what he heck is going on. It works at 70mb/sec for 5 minutes then dies. Did you experience this before adding pcie nic replacement? Sean, something similar happened when I was using the HP NC360T NIC. It just lost the link during large file transfers. I never had any problems using the Intel Gigabit CT Desktop though. It just works. When the problem occurs, try looking at the ARP table and system logs for clues. Ok, got the new NIC in there and the problem continued. So, I trashed network prefs and also yanked the AppleIntel kext from clover EFI. Now seems to be working. That AppleIntelE1000 kext doesn’t need to be in there nor S-L-E? Or will the system lock if I ever plug in ethernet? (BTW, I got the Turtle Beach per your advice. Works super great). … new NIC is the Intel CT with the injector you provided. If it works for you in S/L/E just put it there. I prefer loading it from Clover. Actually, it should be even possible replace the Injector kext with some Clover injector configuration. One last thing… I installed the BCM94360CD for native wifi and BT LE. Both work great and handoff/continuity says YES but Continuity Activation Tool says I have a bad board-id: “expect 20 characters”. My board-id is 20 characters from MP6,1 in Clover. I must be missing something. Now it magically works. Peace! Hi – I am a mac freak but last week decided to build my own Hackintosh. Have the same board as you. For the benefit of myself and others who are seemingly experiencing difficulty in installing Yosemite on this board, could you do an idiots guide? What I know is what I know but what I don’t know I’m spectacularly lacking! Have you changed any BIOS settings on the board prior to installing – or does Clover do the lot? 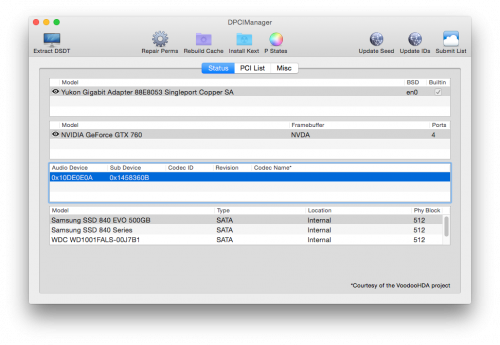 Some forums suggest disabling all SATA drives except the one installing the OS X to if booting from a USB stick. Matt, I’m afraid, it would take hours to come up with a step by step guide. I just don’t have that time. However, you should be OK following any recent UEFI Clover installation guide. Please keep in mind that things might get more complicated if you want to use Integrated Graphics. I don’t remember changing any BIOS settings except for IG and onboard audio which I both turned off. Good luck! I also only get P-States 8, 40 and 44. According to what you’ve put here you are saying that means its working okay? So I don’t need to mess any further with it? I’ve got a really similar setup as you, same mobo, same cpu, similar other stuff and also did clover install. Everything is also running very well for me, mostly without having to do anything really. I just have a question about speedstep. Speedstepping works as well although I’m only seeing P-states 8 and 40-44. I tried different SMBios-settings and using a SSDT in Clover generated with ssdtPRGen.sh all to no avail, it did not make any difference to the P-state spread. There could be other reasons but the main reason why this error shows up is outdated SMBIOS information. 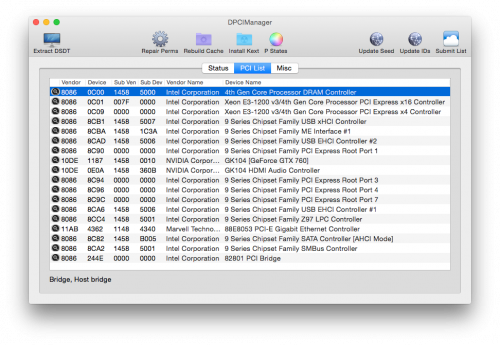 OS X thinks your rig is too old for Yosemite when comparing it to an internal list of logic board IDs. OK, awesome. I stumbled onto that and grabbed a standard config and it installed correctly. I am mostly up and running with your board and CPU, but have a few items left on the checklist. 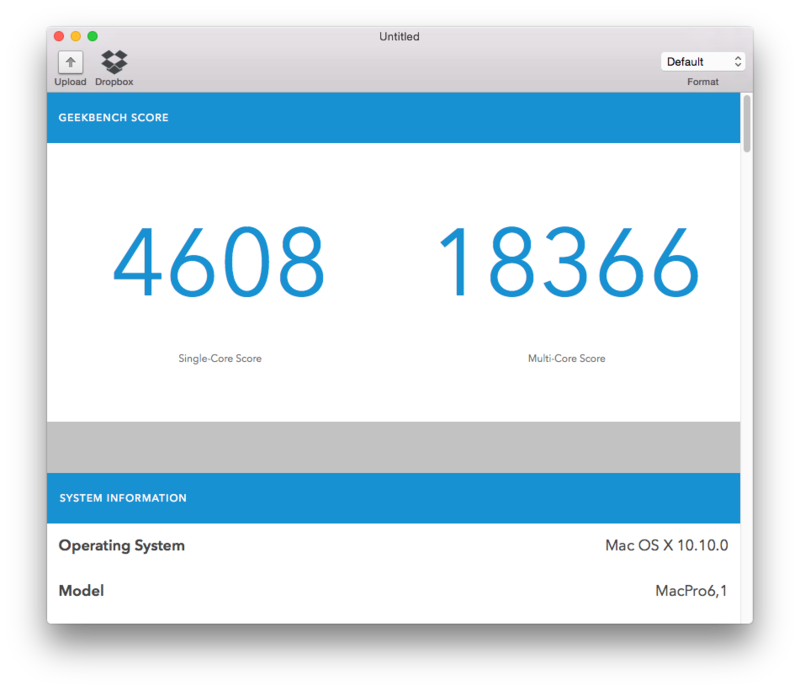 I have a HIS 280X GPU which worked under Mavericks and Unibeast install (EFI trick). But, wanted to go clover for Yosemite. I can get to the bootloader, choose my install and have it get about 1/2 way with the _displayport_ but then the monitor shuts off. I can get fully booted with DVI. New to this… a smbios thing? I checked your smbios in config and it was mac pro but then your RT is imac 14,1. I’m not really sure what I’m doing in clover… trying to get up to speed. Isn’t the imac 15,1 the closest configuration to our mboard/cpu setup? Ok, I was injecting ATI. Unchecked that and now have displayport from 280x working. But still curious about the correct SMBIOS and RT. Sean, I don’t disagree with you on using the imac 15,1 SMBIOS information. When I wrote the post, the new iMac wasn’t around and that’s why I chose the latest MacPro. Which still works for me btw. Oscar, you’re not providing any information except for the hardware. Did you use a Clover installation guide? If yes, select the verbose boot option. Btw. setting up the first Hackintosh using Clover can be quite a challenge and is definitely a steep learning curve. Bought the same hardware as you. But i can not get it to work. The osx instaler begins to load, but then stops with a fat circle with a line in it. Would it be possible to get a raw, iso or img of a working usb instalation? So that i now if it is the instaler or he hardware/bios that is set wrong. My real mac (mac pro 1.1) can not run higer osx than 10.6., stable. So that is a bit of a broblem to. I would realy apriciate anny help. Did you use the Legacy or UEFI Clover instructions? I’m sure I speak for everyone when I say that a more detailed explanation would be donation-worthy! How did you get the correct information to show correctly in DPCIManager? I used the instructions from the link you posted to set up Clover. My plist will only work with a natively supported graphics card. Are you trying to use Intel integrated graphics? Just getting started with the same board. I am running into trouble when I tell clover to launch the OS X Mavericks installer. I setup my USB install drive using the clover instructions found on tonymac It goes to a “not” symbol and hangs. Can you point me at the specific install instructions you used for clover? I haven’t made any adjustments to my bios. I replaced the config.plist file with yours after installing clover in the /EFI/CLOVER directory. Any tips, or more detailed instructions would be appreciated.